NEWARK (Oct 4 10) – Planning board members and residents got their first look tonight at an $8.8 million, 50-unit, three-story apartment building planned for the western side of the village, bordering two neighborhoods and Newark high school property. Conceived by Lakeview Mental Health Systems, the 66-foot tall (with cupolas) structure has been designed taking “cues from the context and history of Wayne County.” Housing 48 one-bedroom, 675-square-foot apartments and two two-bedroom apartments, the site will reserve six units for Wayne ARC clients, 20 for FLACRA (Finger Lakes Addictions Counseling and Referral Agency), 18 “certified” and “supportive” units for Lakeview customers, and six for anyone else. 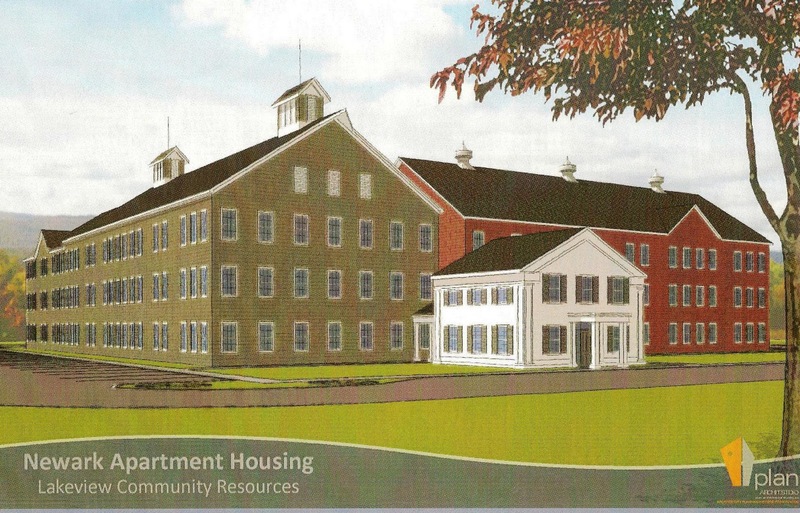 In an hour and a half of questioning, residents and planners asked for details on the project and the population served, and expressed concerns about the effect of the site on neighborhoods, village services and taxes, and the nearby school. Attorney James Grossman, a partner in Hiscock & Barclay in Rochester, guided the presentation made to the planning board. Mark Wickham, CEO of Lakeview, engineer Peter Vars of BME Associates of Fairport, and architect Mark Pandolf of plan Architects of Rochester made the presentation. The construction of the site will put 150 people to work for 10-12 months, with many of the workers from the community at large, Lakeview says. Vars explained the 47-acre site will only use 12 acres in the R-2 Area for construction, where apartments are a permitted use. The building will have 53,000 square feet, with an 18,000-square-foot footprint. The site was chosen because it has existing gas and sewer lines, and it’s located near services (Wegman’s plaza). A wooded buffer will be maintained on all sides, with no access planned off Colonial Drive – Hope Avenue will be used as the site entrance. Lakeview will need three variances – for parking spaces (78 are planned, 84 are required), for minimum apartment size (850 ft2 is required, planned is 675 ft2) and building height (maximum is 35 feet; this is 66 feet tall). The zoning board will also see the plan, but the planning board could not make its recommendation tonight – the Wayne County Planning Board has not discussed Lakesview’s plan yet. Code Enforcement Officer Mark Peake said that after the meeting had adjourned, he and village staff met informally with the developers. “They will not be attending the Planning Board and Zoning Board meetings in November. They are going to re-examine their design and look at the other concerns raised during the meeting before they come back,” Peake said. Architect Pandolf said the 675 square-foot apartments were “of ample size,” compared to what Lakeview has in other projects. The apartments contain a kitchen, living room, bath and 100-square-foot bedroom. The building also houses staff offices, conference rooms, and a community room for resident use only. Pandolf designed the complex “to look like a group of barns with a farmhouse (containing the community room). “Will someone be on site 24 hours every day?” asked Planner Jerry Wage. “No,” said Wickham. There would be “availability” for someone to get there quickly. “Do you think that’s wise with the clientele you have there?” asked Wage. “A three-story building doesn’t ‘fit’ into too many places in the community at all,” said planner Joe Nicosia. “Have you talked to the fire department about its ability to service the building?” Vars said the fire department hadn’t been contacted yet, but would be before the next application. Wage asked about the construction of the building – wood or block? “Wood frame,” said Pandolf. “Have you considered the impact on local landlords?” asked McBride. Wickham said Lakeview’s marketing survey showed little impact. Nicosia asked if many of the residents will drive. Wickham said most will walk or use public transportation. “Do you plan to put a sidewalk to the plaza?” Wage asked. “Yes,” said Vars, “but we just can’t dump them (residents) there.” More planning is needed. James Turner of Hope Avenue asked if the rents were subsidized. “Yes,” said Grossman, adding that the state guarantees the rent. “Are you saying the state guarantees this not to fail?” asked Nicosia. “It is up to us to keep it occupied and safe-operating,” said Wickham. A 90 percent occupancy rate is expected. Resident Tom Love asked what the rent was on the apartments. He didn’t get an answer, but did learn that more than half the rent was subsidized. Resident Peter Wohlrab, who has a 20-unit apartment building next-door to the site, figured that each Lakeview unit would cost $150,000. “If I could get $50,000 for each of my units, I’ll go to Florida. I didn’t pay $150,000 for my five-bedroom house.” He said he would lose tenants when the project opens. Wohlrab figured the taxes on a 50-apartment structure would hit $340,000. “But I have a sneaky suspicion you’ll be paying less in taxes than my 20-unit apartment.” He said the concentrated population of the new development would create stress on local services. “Newark village is really going to take the brunt of this,” he predicted. Nicosia was concerned about the impact of the development on Edgett Street – the access to Hope Avenue. People walking to and from the project and all public transportation and emergency services would now use Edgett, a very quiet street. 7 Comments to "NEWARK GETS FIRST LOOK AT 50-UNIT BUILDING FOR SPECIAL NEEDS RESIDENTS"
It is clear that Newark, already in decline because of years of influx of "special needs" and "recovery" programs, has been chosen because the LAND IS CHEAP. Why is the land cheap? Because Newark is now known as the place to go if you need a handout, or a support group for your addictions. Our once beautiful middle class neighborhoods have been chopped up into "studio type, mostly subsidized "units". We are made to feel that taking pride in our homes is wrong. Newark is afraid to enact tough zoning because the current board and Mayor is afraid if being sued. (A committee currently exists that will no doubt relax instead of toughen the current zoning)We will see. Let's not blame the code enforcement officer. He is dealing with the weak codes. Please folks, don't blame this on URBAN RENEWAL. Take a look at Lyons and Clyde. Ghost towns. Do the problems of those communities make us feel better? No. No community has helped the less fortunate more than Newark, N.Y. We are the needy now, and are looking for some relief. At 30%-40% tax exempt, we have to say, Sorry, go somewhere else. Are our Planning and Zoning Boards up to it? We will see. The "residential setting". Another phrase would be "mainstreaming". We have heard it all. Time to stop. These comments betray incredible ignorance about the point and impact of these projects. Providing safe, clean, affordable, mixed-use housing has been a benefit to those communities which have embraced this concept. Of course, there will always be those who prey on bias and fear with regard to people who have special needs to oppose projects such as this one. Also, to refer to Lakeview as an "outside entity" is ridiculous. Lakeview (a not-for-profit agency)has been providing housing services to Wayne County residents for decades. As far as I know, Lakeview is the ONLY provider of such services for those recovering from mental illness in the county with the exception of a group home operated by DePaul in Macedon. They provide these services much more cheaply than taxpayers could if we assumed responsibility for them. Take your liberal views to Pittsford and try to ram something like this down their throat. More ignorance. This is not about "cheap land." The project budget includes an ongoing "PILOT" (payment in lieu of taxes) which will likely return more revenue to the town on a yearly basis than it currently receives from taxes on the land as it now stands. With regard to the "no income" remark, this is also wrong. Those who live in low income housing (per HUD regulations) HAVE TO PAY 1/3 of their monthly income toward rent. When you speak of "spreading the responsibility around a bit" who do you think will be living in these apartments? It's people who are already in the community. Are you suggesting that we try to send them to other communitities as a way of spreading them around? The remark about "recovering drug abusers next to school property" is precisely the kind of bias and scare tactics referenced in #3 above. Again, the fact is that people in recovery are ALREADY living in our community next to schools, businesses, etc. So, we have an agency that has decades of experience working in our community with recovering individuals that wants to provide decent, clean, safe housing for these people from our own community. And research shows that people in recovery do better in safe, stable housing. And the response, based on ignorance and fear, that some would have us make is: "go somewhere else." Let's hope that most in our community can see how this is a benefit in every way. There's no downside. This is what we need more of is facts when talking about issues.....ignorant!!! hopefully you have opened your mind....or you can head back and listen to the Savage Nation show or Glenn Beck. Sounds lik a good project!! Boy 50 units with a majority with concerns whether they are flacra customers or arc clients and no full time staff on site good luck with that. I do not see an upside for your village.